Clean lines and cylindrical modern design make the GROHE Tallinn the natural choice for today's cosmopolitan kitchen. The extended comfort spout height embodies minimalist beauty in its purist form, while the pull-out dual spray with toggle function allows for seamless switching between spray and regular water flow. Furthermore, the forward-rotating lever handle eliminates backsplash interference. Elberon Dual Spray Pull-Down Kitchen Faucet. Sleek, modern and undeniably alluring, the Elberon Collection features a distinctive combination of graceful style and state-of-the-art technology designed to captivate with a single glance. Smooth, flowing lines attract the eye with remarkable beauty while meticulous GROHE engineering offers effortless, intuitive performance. GROHE StarLight chrome finish. With its fluid curves and graceful gooseneck design, the LadyLux3 Cafi single-handle pull-down spray head kitchen faucet is as elegant and eye-catching as it is functional. Standing 14 -3/4 inch tall, its striking profile comprises a high-arc swivel spout that extends 8 1/8 inch in reach and incorporates a pull-down sprayhead. Locking spray control allows users to switch between two spray modesregular flow and spraywith a simple push of a button. GROHE SpeedClean protects the spray nozzles against limescale buildup, and the lever handle, equipped with a GROHE SilkMove for a lifetime of smooth operation cartridge for smooth control of the water temperature and volume, rotates forward to turn the faucet on, eliminating installation issues relating to backsplash clearance. LadyLux3 Cafi has a 1.75-GPMwater flow and comes in GROHE SuperSteel Infinity Finish. By combining superior technology with a choice of breath-taking designs, GROHE can provide you with all the elements to enhance your bathing space. GROHE's fittings unite a beautifully elegant appearance that can work in a full range of design schemes from traditional to modern with quality materials, German craftsmanship and superior innovation for long-lasting performance. The impressive portfolio of products that not only dial up the design quotient, but also leverage technology in clever ways to yield smart and sophisticated homes. The GROHE Veletto Pull-Out with Soap Dispenser in SuperSteel InfinityFinish. will turn heads with its sleek profile and bold, angular good looks. European designed and German engineered, the kitchen faucet features a side lever handle equipped with a GROHE SilkMove. cartridge for easy maneuvering and precise water temperature and volume control, as well as a swivel spout that rotates 360 degrees for maximum accessibility. The dual-function pull-out spray head has GROHE SpeedClean. spray nozzles, which protect against limescale buildup, and easily transitions between stream and spray functions with a push of a button. Durable GROHE SuperSteel InfinityFinish. is a scratch- and corrosion-resistant matte finish that retains its flawless appearance even after a lifetime of use thanks to GROHE StarLight. technology. 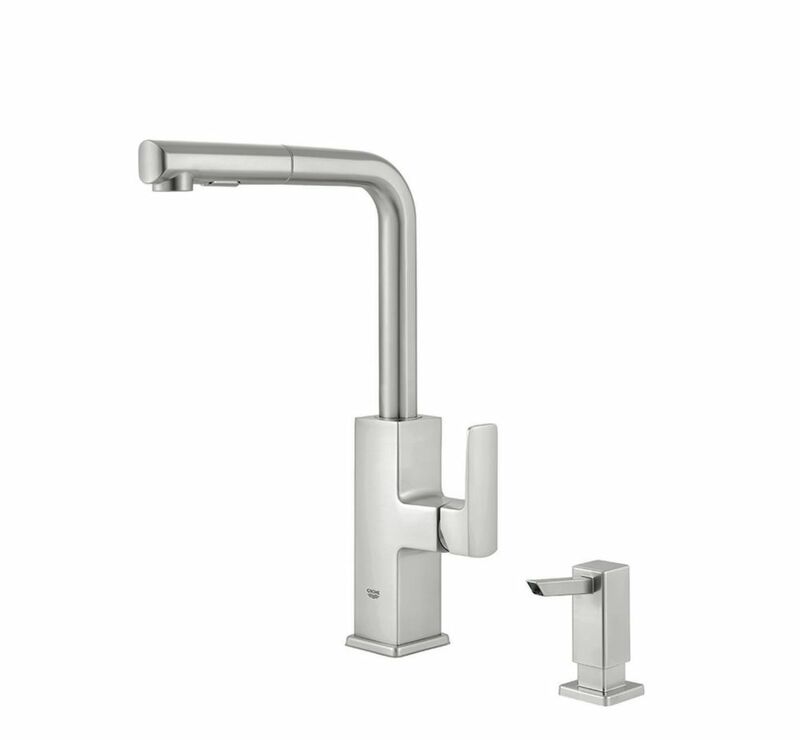 Tallinn Single-Handle Pull-Out Spray Kitchen Faucet in SuperSteel Infinity Finish Clean lines and cylindrical modern design make the GROHE Tallinn the natural choice for today's cosmopolitan kitchen. The extended comfort spout height embodies minimalist beauty in its purist form, while the pull-out dual spray with toggle function allows for seamless switching between spray and regular water flow. Furthermore, the forward-rotating lever handle eliminates backsplash interference. Tallinn Single-Handle Pull-Out Spray Kitchen Faucet in SuperSteel Infinity Finish is rated 4.5 out of 5 by 18. Rated 3 out of 5 by Barbara from Too tall (not the faucets fault) but also didn’t function... Too tall (not the faucets fault) but also didn’t function properly and when it did splashed all over since it was so tall ! Returned for another. Rated 5 out of 5 by HomeDepotCustomer from Very nice faucet, solid, all metal extremely well made. ... Very nice faucet, solid, all metal extremely well made. Rated 5 out of 5 by Nicole from Very sturdy, looks just like the picture. The only thing... Very sturdy, looks just like the picture. The only thing I did not care for is that the soap dispenser is plastic, feels very flimsy it will probably break one day but other than that looks great. Rated 1 out of 5 by Ully82750 from I'm disappointed with this faucet the first time I turned it on. We just did a whole first floor/... I'm disappointed with this faucet the first time I turned it on. We just did a whole first floor/kitchen renovation and decided to get something new and "modern" looking to replace the Kohler H2O faucet. I thought it would be shorter in vertical profile but I was wrong; the nozzle hangs about 2 inches higher above the sink than my old Kohler H2O. In the back on my mind, I'm thinking we may be replacing it the moment it starts dripping or something goes wrong with it. The water that comes out of the nozzle is very narrow, regardless of being in regular water flow and high-performance spray. It has very high water pressure when it comes out--it splashes. Who wants to wipe their counter, whether water or food matter, every single time you use the faucet? Rated 5 out of 5 by Bill from Excellent faucet, it looks great, and feels extremely well made. Excellent faucet, it looks great, and feels extremely well made. Rated 5 out of 5 by HomeDepotCustomer from I think HD must have more products from this brand>... I think HD must have more products from this brand> It is excelent.